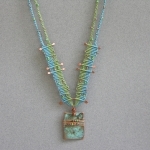 Jewelry that is an integration of fiber, metal, and color. 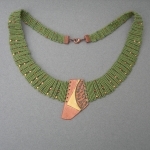 Cotton threads that are hand-knotted using micro-macrame and cavandoli techniques are combined with copper and/or brass that has been torched, hammered, patinaed, and/or enameled. Art, creating, crafting have always been a part of my life. I was born in Dallas, TX and grew up in St. Louis, MO. I attended Meramec Community College where I was introduced to ceramics by master artist and craftsman, Bob Allen. Then moved to San Jose, CA and attended San Jose State University where I majored in art with a focus in ceramics. We eventually moved back to the St. Louis area. 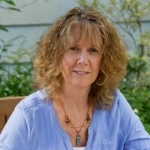 Over the past 40 years I have worked with ceramics, basketry, off-loom weaving, and jewelry while raising a family and teaching middle school social studies and English. I have always been intrigued with combining ceramics/glass with fiber and find jewelry making a perfect avenue to express my creativity. 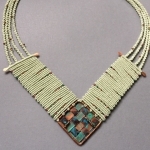 I am drawn to natural materials, cotton threads, stones, ceramics, glass and metals – especially copper. I strive to maintain an organic feel to my work. We live in the country on top of a hill that overlooks the Mississippi River valley, and we can see the bluffs of Illinois. I am surrounded by the colors of nature – depending on the time of the day or the time of the year. I bring this love of color into my jewelry making. I hand-knot cotton threads, using micro-macrame and cavandoli techniques, that become an integral part of the piece of jewelry. 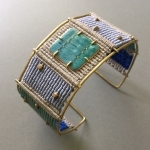 The colors of the threads become an essential part and combine with the copper, stone, ceramic, and/or glass to create a unique piece of jewelry.